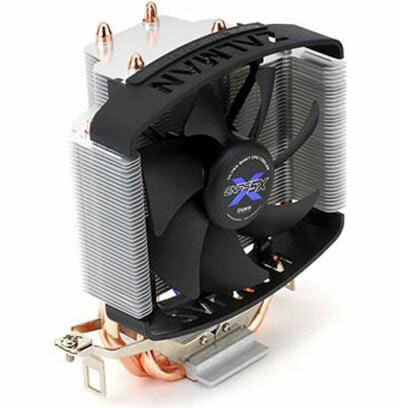 Product Details: Zalman Ultra Quiet CPU Cooler . Condition: new Main function: It is used in computer CPU cooling, intel and AMD dual-platform support. Design for disperse heat away from the CPU via heatpipes effectively, quickly cools the heatsink so that the overall operation of the computer CPU to achieve rapid ,good results, stable operation and high performance. Specification: Material: pure Aluminum and Copper. Dimensions: 127 x 64 x 134 (LxWxH) mm . Weihgt: 320g. Fan size: 90 x 90 x25 (LxWxH) mm. Bearing type: Hydraulic. Fan speed: 2,000RPM�10% Noise: 26dBA�10% Features: high cooling Performance, rapid heat dissipation . unique u-type heat pipe design, 3 heat pipes, DTH contact with copper bottom. wide compatibility. applicable in the case of tower and full tower ATX. easy installation and easy to use, really fashionable and practical. fan automatically, durable, high quality, provide a very low noise. make various parts work easily and rapidly, operation well. Support: Intel socket 1155/1156/775CPUs, compatible with Core i7/i5/i3/2 Quad/ 2 Duo/2 Extreme/ Pentium Dual-Core/ Pentium D/ Pentium 4/ Celeron. AMD Socket 754/939/940/AM3/AM2+/AM2CPUs, compatible with Phenom II/ Athlon II/ Phenom/ Athlon FX/ Athlon X2/ Athlon/ Sempron/ Dual-Core Opteron/ Opteron.